Imagine a Klondike Bar without the chocolate shell. Just a nice thick square of vanilla ice cream. That’s basically what White Bear (白熊) Ice Cream is. The picture shows a spoon, but who needs that? The wrappered slab of vanilla fits in your hand comfortably, no utensil required. The ice cream is pretty good… rather creamy for a Chinese brand. It costs 5 rmb. I think I still prefer 大块头 ice cream at only 1 rmb, but I don’t have a scan for that. Apparently in Chinese you can say either 白熊 (literally, “white bear”) or 北极熊 (literally, “North Pole bear”) for “polar bear.” My dictionaries don’t indicate a distinction between the two terms. Based on my own experience, 北极熊 is more common, but I can’t say I’ve really had many conversations about arctic animals in Chinese. 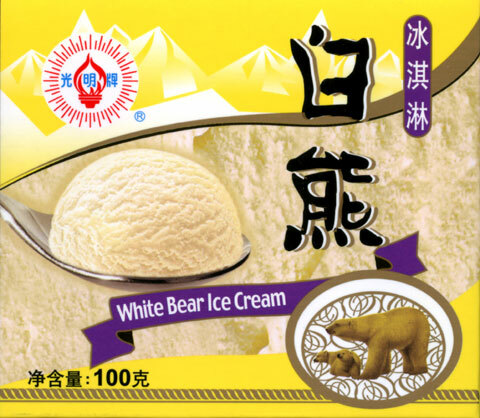 Klondike Bar folks use a white bear as a spokesanimal for their brown ice cream project, and in China they use a brown bear for their white ice cream product. Balance of energy. Both Chinese and American companies respect the balance and contrast needed to maintain the Tao. Haha, Wades-Giles rules. =) Just kidding. I’ll shut up now. Doesn’t the bar melt rather quickly in your hands without an outer coating? I believe the chocolate on the multitude of ice cream bars in the market are there for a reason: a) taste b) preventing the ice cream from melting too fast c) looks. Suggestion: Take the White Bear bar and sandwich it between two fatty Oatmeal cookies. Then you can drip chocolate syrup all over it. Enjoy. What you get is an It’s-It straight out of San Francisco. No, not really. The last bit is just getting soft as I finish it off. Oops. I stand corrected. Interesting how “scientific fact” changes.